Years and years ago, I designed many pieces in solid colors. My colleagues told me it was boring. 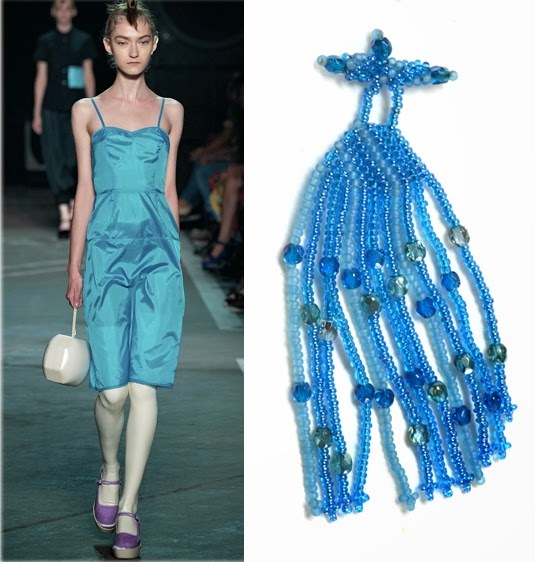 Other (beaded) jewelry designers were creating highly contrasting color schemes. Some I knew personally laughed at me and told me what I was doing seemed uninteresting. Guess what? They weren't laughing when the saw the volumes of bracelets & necklaces I started selling. Dunitz "solid" colored adornments matched every floral, plaid and multicolored striped dress, shirt & pantsuit. Women only needed to love our designs and quality to know our pieces would coordinate with any of their outfits. To this day, my colleagues call me the "Queen of Monochrome." I do create schemes that include an array of colors. These always match "solid" colored clothing. And, every season, I hone in on important fashion trends and zoom in on very specific colors. The clothing designers do the same. Here are a few I project for Spring 2015 with the help of some very influential people. 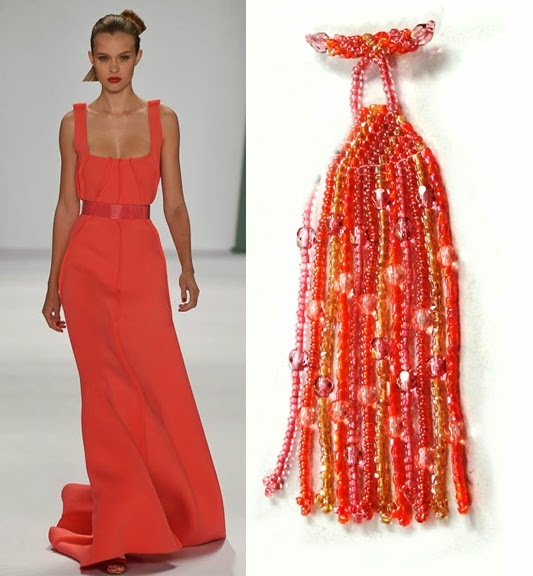 Coral orange was spotted everywhere for Spring 2015. This great dress shown here comes from Carolina Herrera's line up. Dunitz & Company will have the goods to match all of the clothing you'll find on store racks. I love yellow. But, sometimes it is a tough color to wear. My monochromatic pale yellow this season adds a touch of pinky-beige. This "not in your face" yellow will work for most people. 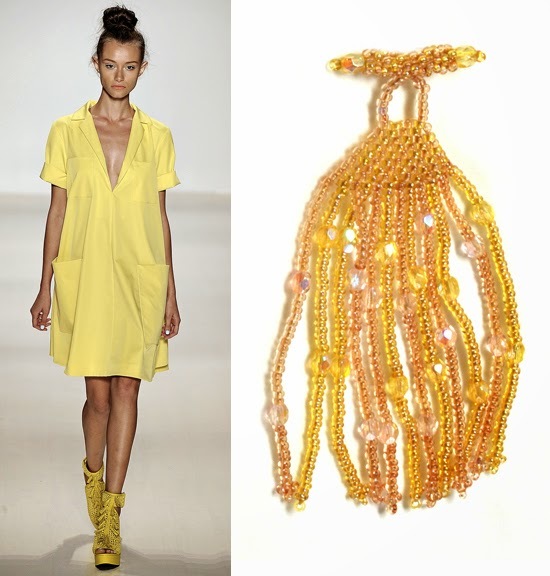 And it will go with the array of yellow you'll find in all the clothing shops this Spring. The outfit shown here was designed by Nanette Lapore. Blue is ALWAYS popular. Yes, almost any shade of blue. You'll find blue will be a big part of the Dunitz lineup for Spring 2015. We wanted to create a scheme that would match every floral, plaid and stripe out there. Our monochromatic capri blue scheme should do just that. Of course, here we're showing it with a solid colored dress from Marc - by, yes, Marc Jacobs.